Dive Journal: Our afternoon dive takes us to Grand Central Station, and we have a lot of fun on this dive. The dive starts in 65 or 70 feet of water filled with the same interesting rock formations we saw at Times Square. Eventually we enter a cave in the side of the island. Our route takes us up over a ridge, then down to about 75 feet and the cave stretches out. There are brilliant encrusting sponges on the walls, several green morays, and a nice Caribbean reef lobster. We pass a feature called the “elevator” which shines a hole of light into the cave from many feet above us. Further along, we see a shimmering surface above and slowly rise into the “phone booth”, a pocket of air trapped in a cavity on the cave ceiling. Johnny and I go up into it for a few seconds, take off our regulators and smell the dank air, leave a little bit of air of our own. Then we giggle and laugh and squeal and yell to accompany the loud tinny reverb in the chamber. We continue further into the cave, rising to almost 20 feet. The surge picks up considerably and we finally exit sideways through a chute of moving water, where we descend again to do more exploring adjacent to the island. 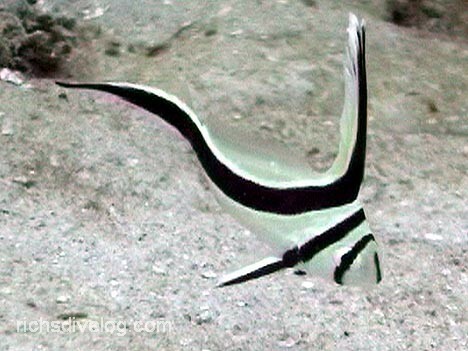 We find a few nice jackknife fish for video, and several beautiful blue Pederson cleaner shrimp. Due probably to the repeated up-and-down profile, Johnny has a bit of trouble with his ears this dive. Back on board the Cuan Law, we start making friends with other passengers, and in the evening we set up the salon table for some card action. The game tonight is no-limit Texas Hold ‘Em, and Linda, Janel, Mark (Texas), Joe (California), and I are in on the action. Joe says he’s never heard of such a game, and after I describe it, he mockingly calls it “TV poker.” The game ends in a monumental all-in showdown between Joe and me, where he has A-Q and I have A-K. A queen comes up on the flop and I fork over my chips. I’m afraid our spirited late night play has kept up some passengers, though, so we’ll have to tone it down in the future.